Altec Lansing Technologies, Inc. is the industry leader in the design, manufacture, marketing, and support of advanced audio solutions for PC's and related technologies. Altec Lansing develops and delivers advanced audio products and solutions to leading OEM and Retail customers through various outlets. Altec Lansing currently distributes a variety of multimedia products to the worldwide computer and consumer audio markets. Many of these leading Altec Lansing products include innovative audio technologies such as streaming audio data through the Universal Serial Bus (USB). Also included in the company's line of high quality peripherals are digital audio systems, digital RF audio systems and portable computer audio products. Today we take a look at one of the latest media offerings from Altec Lansing which is the recently announced M812 system, which is a complete wireless speaker system for the iPod line of audio devices (generation 3 iPod's and newer). 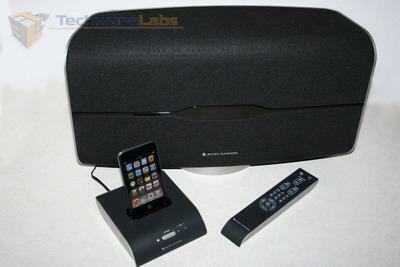 The M812 system comes with one speaker that contains two 4-inch woofers and two 1-inch tweeters, the systems dock is expandable and allows you to add up to seven more (8 total) M812 Wireless Speakers in one complete wireless stereo system with a single dock, with the most notable feature being that they can all be adjusted for stereo separation. So if you have two M812 Wireless Speakers you can set them up to have a left channel and a right channel for true stereo separation. The dock also contains an auxiliary input port that allows you to connect other media audio devices and an FM Tuner with the remote that allows you to pre-program up to six of your favorite FM radio station channels for your easy listening pleasure.